Ah Thanet. This glorious stretch of golden English coastline has inspired artists for centuries, including of course Turner who said: “…the skies over Thanet are the loveliest in all Europe”. 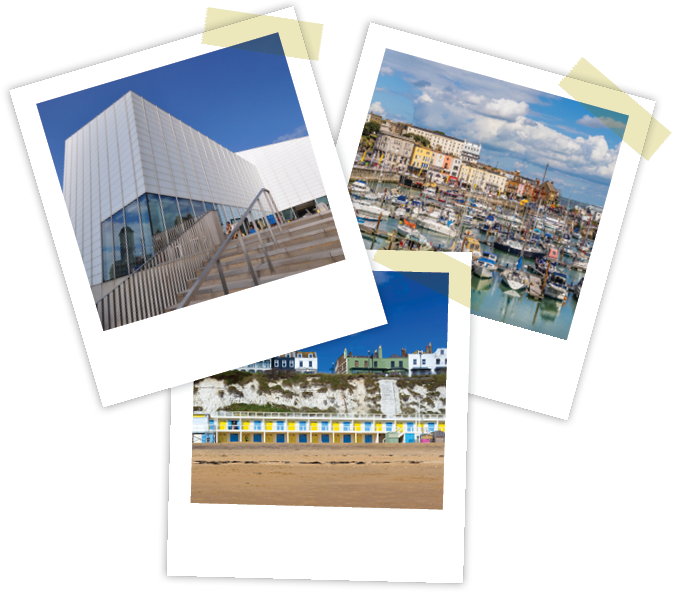 Margate and Ramsgate are enjoying a massive revival at the moment, with iconic retro seaside destination Dreamland up and running again in Margate, and a lively alternative music scene can be found in Ramsgate. The Turner Contemporary art gallery provides a destination for art lovers while the old towns of Margate, Broadstairs and Ramsgate feature some of the most fabulous Georgian architecture, enlivened with micropubs and independent retro shops. House prices in Thanet are a fraction of the price of London properties and you can snap up a family home for less than £350K. Did we mention the beaches? Mile upon mile of golden sandy beaches! Swingboats at Viking Bay! Surfing at Joss Bay! Smugglers coves at Botany Bay! Thanet! It’s flipping lovely!